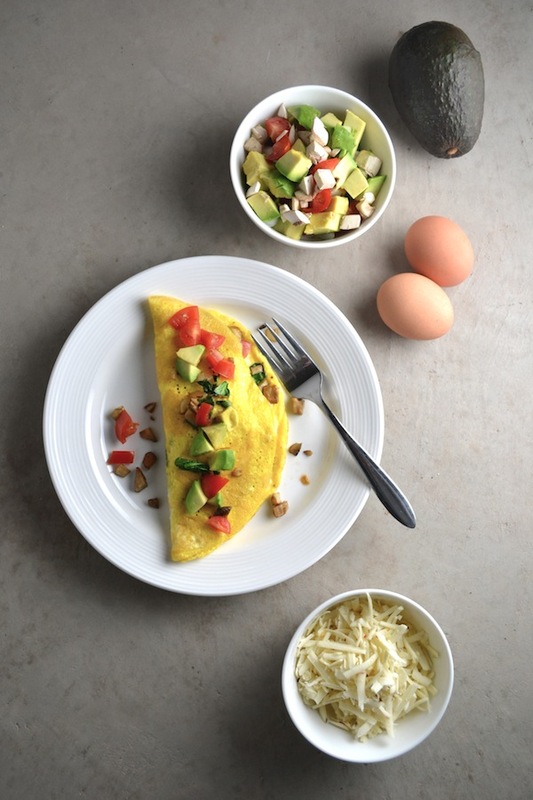 Whenever I eat an omelet loaded with fresh vegetables I think…hmmm…why don’t I eat these more often? I absolutely love omelets. And they’re really one of the healthiest breakfasts I can think of. 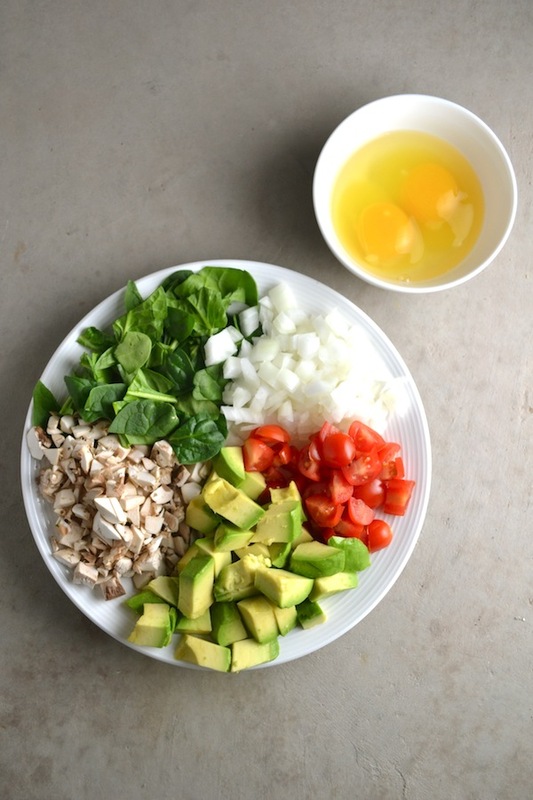 You’ve got your protein from the eggs and your vitamins, fiber, and folate from the vegetables. 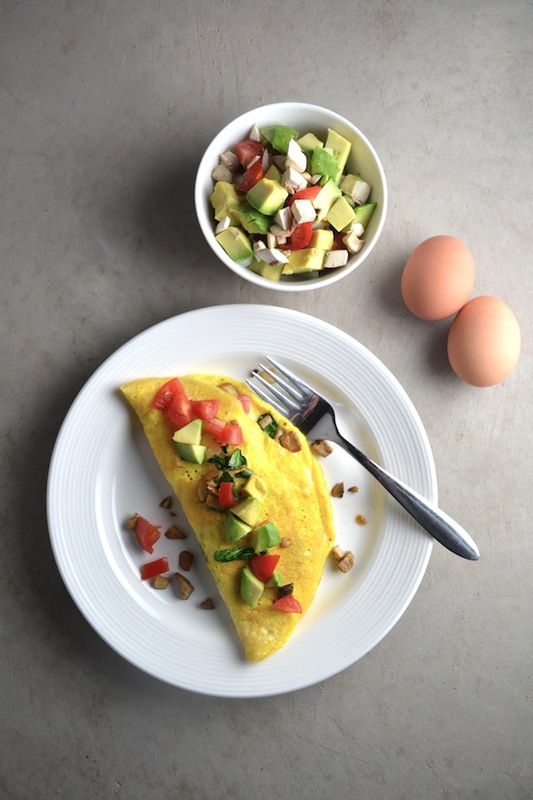 Unlike cold cereal, which is usually very processed and full of added sugar, eating omelets for breakfast will give you an even source of energy rather than a spike in your blood sugar and then a quick drop in your energy. And if you eat eggs and vegetables in the morning you won’t crave sweets and refined carbohydrates as much as when you eat cold cereal. The hard part is having the ingredients and the time to actually make the omelet in the morning because the one downside to an omelet is that it takes longer to make than a bowl of cold cereal. I have some tips for you though: 1) meal plan for the week and include breakfasts in your meal plan 2) chop your veggies and grate your cheese the night before (except for the avocado, it browns too quickly), 3) wake up 15 minutes earlier to allow time for a healthy breakfast. I like to use butter from grass-fed cows or bacon grease to saute my veggies. Read about the best cooking fats here. I like to use eggs from pasture-raised chickens and raw cheddar cheese. And I like to use organic fresh vegetables too. These are my favorite vegetables to put in an omelet, but of course you can use whatever you want or whatever you have on hand. 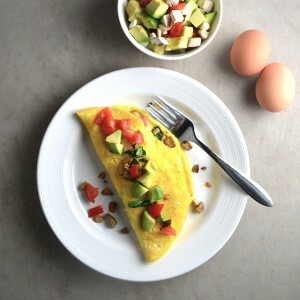 I like to save some diced tomatoes to put on top of the omelet along with the avocado as well. Enjoy! Heat an 8" skillet over medium heat. Add butter and onions to the pan and cook until onions are translucent, about 3 minutes. Add the chopped spinach and cook briefly until it's just wilted, about 30 seconds. Crack eggs into a bowl and beat with a fork until yolks and whites are combined. Add salt and pepper to eggs and stir until combined. Sprinkle diced tomatoes and raw cheddar cheese onto the eggs. Cook until the egg firms up, but don't let it cook too long (about 3 minutes). You don't want the egg browning. Fold in half with a spatula and transfer onto a plate. Top with avocado and extra diced tomatoes.